Thanks for all the comments on my compression post. I will keep you guys updated with that!!! Had I known I'd screw myself over and lose several days of quality training due to this trip...well... hell yea I'd do it again! Balance, right?! But, that said, I won't be doing that again for a long loooooooong time. Vegas is a harsh place. A once-a-year trip is all I need, if that. The smell of cigarettes alone is enough to keep me away--yuck! Thankfully I was traveling with like-minded girls, Tatiana and Sara, so we all experienced a major 180-degree lifestyle change in a matter of 48 hours. Friday night we were at The Wynn and Encore the whole night. Had a way-too-expensive gourmet dinner, but well worth the splurge. Then thanks to Sara's hookups, we got into a Vegas show, La Reve, which is like Cirque but all in and over a pool of water. It's pretty epic what those people are physically capable of doing. I'd probably never pay to see a Vegas show, so I'm glad I got this opportunity. We even got a backstage tour with some of the stars (Sara's friends). Before La Reve After, backstage with the crazy gymnast girls, wow! After La Reve, we hit up a club, Surrender. Apparently Lance Armstrong had been there a couple nights prior. Too bad we missed him; instead we got the lame crowd, so we bounced pretty early--in Vegas terms--and headed to bed. After a mellow refueling break back in the hotel, we then headed to a pretty legit lap pool nearby. I was not expecting much from myself, but the swim went better than expected. Still, I cannot hang with Tati and Sara, those girls are speeeeedy! All in all about two hrs of training for the day; why we did that? I have no idea lol. After the swim... hungry and over working out for the day. Finally it was time to get ready for Saturday night..."the big night" for us that included The Black Keys live at The Cosmopolitan. We started with some quality recovery nutrition: red wine, Pop Chips, cheese, turkey, Pirate's Booty and Bacardi+Diet Cokes. Mmm Mmmmm. 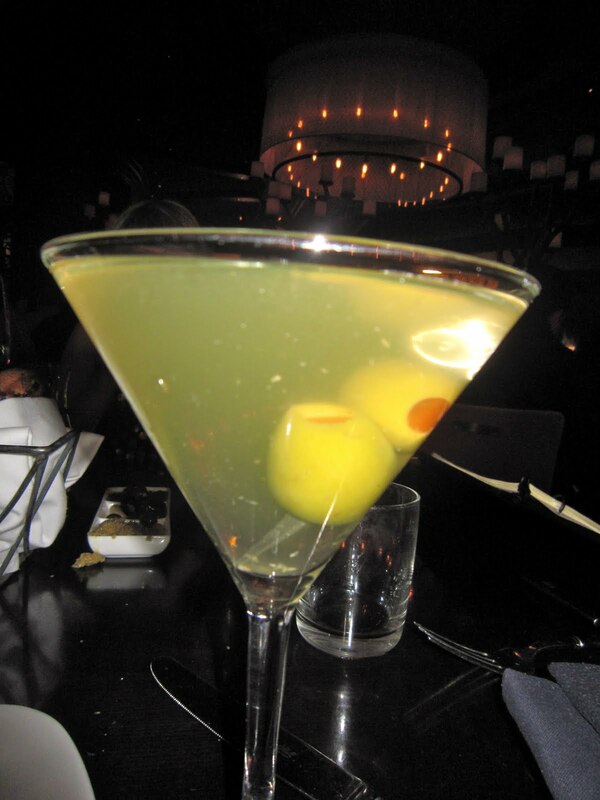 After another nice dinner at Olives, which was amazing and very gluten-filled, we hung at The Cosmo--the place is super fancy shmancy. Somehow some Jameson made its way to us. Oh god, what was I thinking?! I'm a sucker for whiskey. But oh well, I was pumped for the concert and taking advantage of this rare occurrence of late-night social fun. Then the concert. I'm a huuuuge Black Keys fan so all I can say is: EPIC. I loved every second of it. During their set I was pretty much in my own world dancing and head-banging away (yes, I head bang at concerts!!!).... but oh man I was so dang sore the next day from that (or maybe that's because the dancing started at 10 p.m. and didn't end until an ungodly hour. Ouch). After the show, The Cosmo was a blur of people having fun. It was fun. At some point we made it into a club, but it was a little too much for me and not my scene (actually no club will EVER be my scene, but this one in particular was just over the top and annoying). Tatiana agreed and we were ready to go, but somehow we got separated, and then I ran into some friends and we went to a more mellow place and danced and danced.... a late night, considering the concert had ended around midnight. I was able to get some sleep but still woke up too dang early on Sunday. Thankfully the girls did too. We hit the road early. There were lots of good laughs recapping the night, but also lots of moans--our bodies were in shock from all this "foreign" activity. I was home in time for a couple quality recovery meals, then a lovely bedtime of 8:30 p.m.
All in all: Vegas was fun, but not for me. I like my triathlon lifestyle, grandma-ish tendencies and uber-healthy habits. Even so, it was good to get away because I came home focused and extra excited to work, train and do what I do! Question for you guys: Do you ever majorly stray from your training and regular busy lifestyle for a night or weekend of craziness? If so, tell me about it!! Most of all, don't feel bad about those little "let-loose" sessions--own 'em! It's balance. 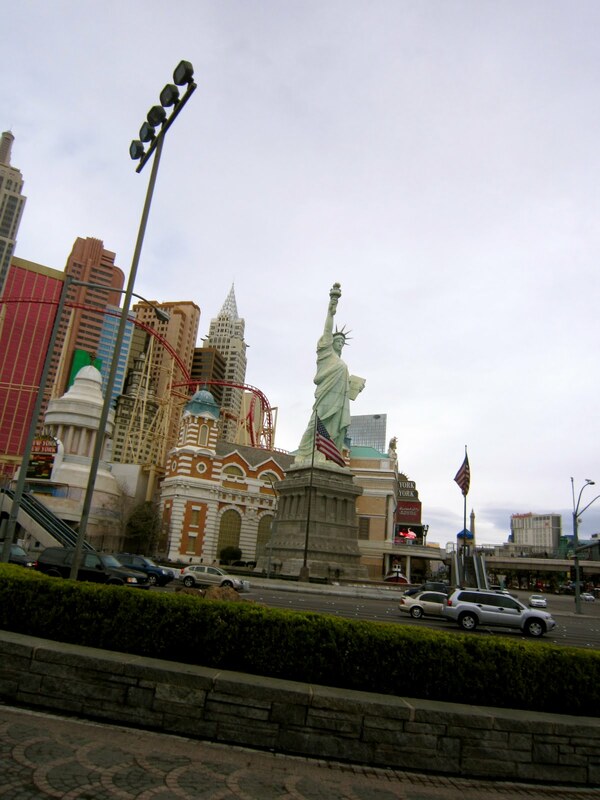 I miss Vegas!! My sister used to live there, and we had a friend who happened to be married to a UFC fighter so we would get in VIP to all the clubs. It was so nice!! Ever since my sis moved, I haven't been back. I'm with you on the grandma tendencies. The hubs and I like to be in bed by 9pm every night. It is good to party it up once in a while though! Call me lame, but I don't really go overboard with the booze or late night outs unless I know I have a full rest day or can fit in the next day's workout later in the day. I need at least one night a week to have a few extra glasses of wine and a HUGE banana split for my own sanity! Sounds like you guys had an awesome trip!! I think it's great to let loose every once in awhile. I'm a whiskey girl too...in fact, drinking some right now!! Yes, I definitely have gone on "let loose" nights, especially when I was living in CA - Stephen and I would head up to LA for parties that would end at...6am :). The best time was when we went to a party in LA and ran a 5K a few hours after the party ended...and we both PR'ed :). Good times! That said, I'm usually in bed by 9pm these days. I shoulda went to a concert while I was there but it didnt occur to me until after. I on the other hand LOVE clubbing/dancing and always go once a month. I dont enjoy drinking and HATE smoke so that is lik a once a month release/all nighter to me. It surely wreks me the nxt day and I sleep all day, but dancing all night to amazing music is surely worth it. i'm headed to vegas next weekend for my once-a-year trip. looking forward to balancing training with a little more "fun" than i'm used to! where's the lap pool you guys found? 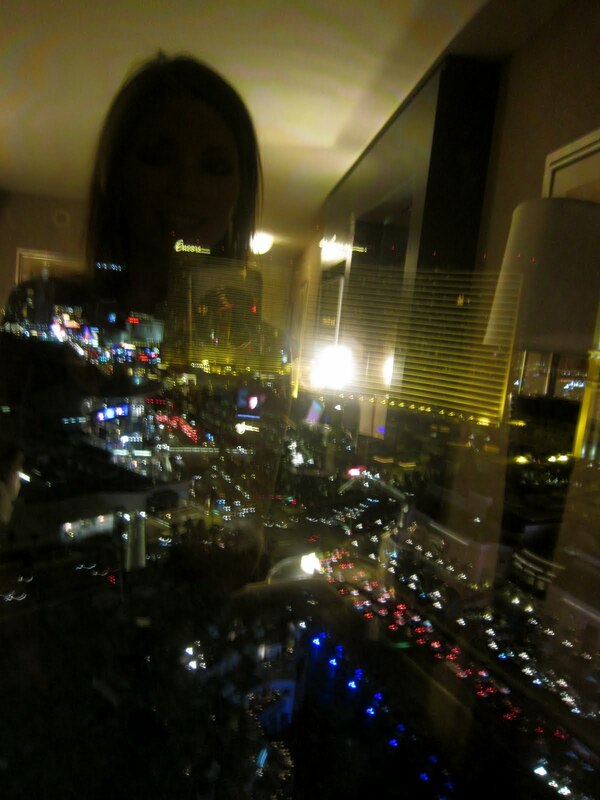 I feel the same way about Vegas... it's fun, but in small doses... AND I'll take my "grandma bedtime" and healthier food... (not to mention the clean air of not second hand smoking a pack of cigs) over the craziness any day. 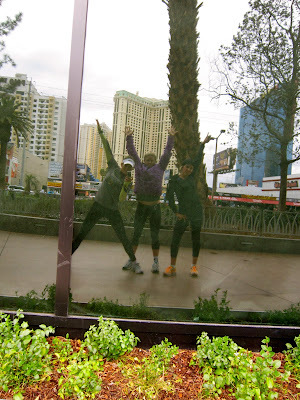 The best vegas experience I had was the very early morning before I ran the Rock and Roll Marathon in 2009... as we were walking to the race start, in our crazy costumes with reindeer antlers, etc.... we were given the oddest looks from the drunks heading home from the clubs... they looked at us like WE were the crazy ones. However, they were ridiculously drunk and acting like idiots - and they thought We were the oddballs!! I love the Vegas Strip run! Gotta' get those miles in and no matter where you are, there's always ground to run on. I really never take time off of scheduled training for social events. It really works more so that I use the training schedule as an excuse not to be able to go to events I'd prefer to avoid. haha Maybe that's bad... I will rearrange my schedule at times though, but I never miss a certain workout unless it's for injury or work reasons.